You've probably seen me write about Swagbucks a lot on here recently and you may be wondering why I'm talking about it so much? 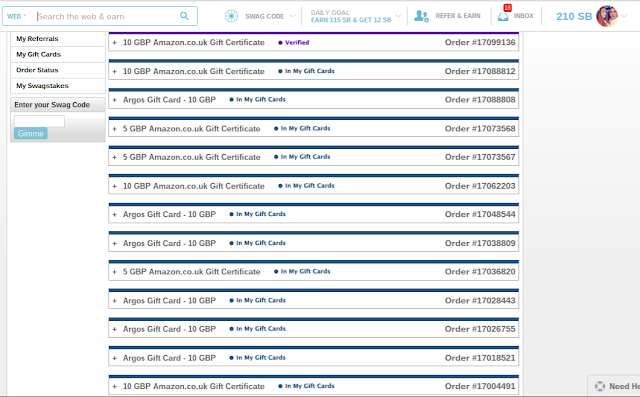 I signed back into Swagbucks on the 16th of September after sadly abandoning the site for a little over a year due to work commitments, since signing back in on the 16th of September, I have earned £235 in a variety of vouchers (Argos and Amazon) and have purchased one of Spud's biggish Christmas presents which I wouldn't of been able to do until December if Swagbucks wasn't around! So Swagbucks, it's a 100% completely free to join site where you earn points (called SB) for things you're probably doing online already, like searching the web, watching video's, discovering deals, taking surveys and playing games. You then take those points and exchange them for gift cards to places like Amazon, Argos, John Lewis, TK Maxx, Curry's, PayPal and many more UK retailers (of course if you're in America then you'll have places like Walmart, Target and other US stores!). 1. Sign up through my link here. 3. Complete a minimum of ONE survey before November 4th, and you'll get an additional 100 SB credited to your account after the period ends. So lets recap - if you do all of those things above in steps 1-3, you'll have at least 700 SB to spend, so you'll have enough for a £3 Amazon voucher, or a £5 Marks and Spencer voucher, and only be 20 SB away from a £5 Amazon voucher, oh and by the way earning 20sb is super easy, just watch a few rounds of video's on the apps and you'll be there in no time! Oh and one more thing, signing up in October is one of the best months to sign up in as there is SO MUCH going on at Swagbucks this month, with great earning opportunities going on all month long, why not give the site a search on Google and once you're happy come back here and sign up with my link so you can start earning your own vouchers! ?